This weekend Dawn and I along with two of our kids, David and Hannah were able to go to my home town, Fresno. 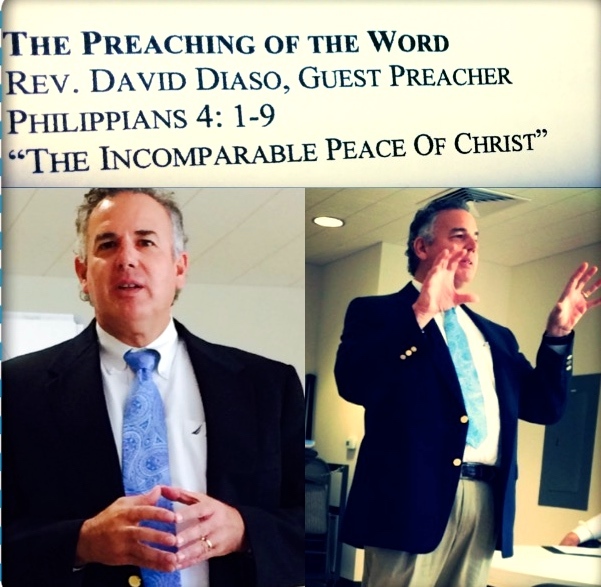 Sunday morning I preached at Sierra View Presbyterian Church on Philippians 4:1-9, on The Incomparable Peace of Christ. I love the promise that God gives us in this passage in verses 6-7. It’s like the soldiers that are ready, watching over, guarding and protecting the city. The Lord watches over and protects us. What a beautiful promise of God that he will care for us and protect us. It’s something that should bring us much peace and encouragement. We know that God loves us and he rules over all things, so he has a good purpose for everything that happens. Even though God doesn’t always respond to our prayers how we would like him to – he does respond how we would if we knew all that God knows! I’m so grateful that the Prince of Peace promises us a peace that passes our understanding. An incomprehensible peace, because it’s so huge. As we pray God does respond. These are promises that are worth remembering and meditating on. I pray that they will be a blessing to you as well. Some of the things that made it extra special for me to be able to be in my home town and preach at Sierra View are that my parents and my brother and his family were able to be there with us! Also, Sierra View has been the church that has partnered with us for the longest, since we started in ministry in 1988. We’ve known each other for a long time. Thank you Lord for your many blessings and for encouraging me and my family through your people this weekend. I’m off to Los Cabos and La Paz this Monday morning to help set up our new church planting project in La Paz and to look over the damage done by Hurricane Odile. Pray for a profitable trip and the Lord watches over and cares for my family while I’m gone. This message was an encouragement to me today, so thanks very much. Glad that the Lord used it to encourage you – I pray the Lord’s rich blessings on you! The Woman with 4 Husbands! Learning to Practice What I Preach!